THREE MONTHS FROM TODAY. When surveyors show up at your home health agency in just three months from today, they’ll expect to review your Emergency Preparedness program. Yes, the start date for new CoPs has been delayed until January 2018 — but don’t get confused. Your agency is still required to have its Emergency Preparedness Plan in place by this November. Home Health Solutions Owner and President J’non Griffin has been traveling across the country to present workshops to help agencies meet the new Emergency Preparedness requirements in time for November surveys. 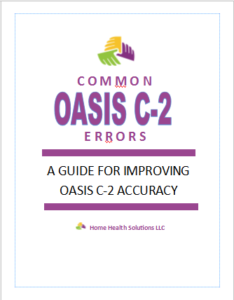 Her expertise is also condensed into an easy-to-follow 12-Step EP Assembly Kit available for order now in the Home Health Solutions online store. 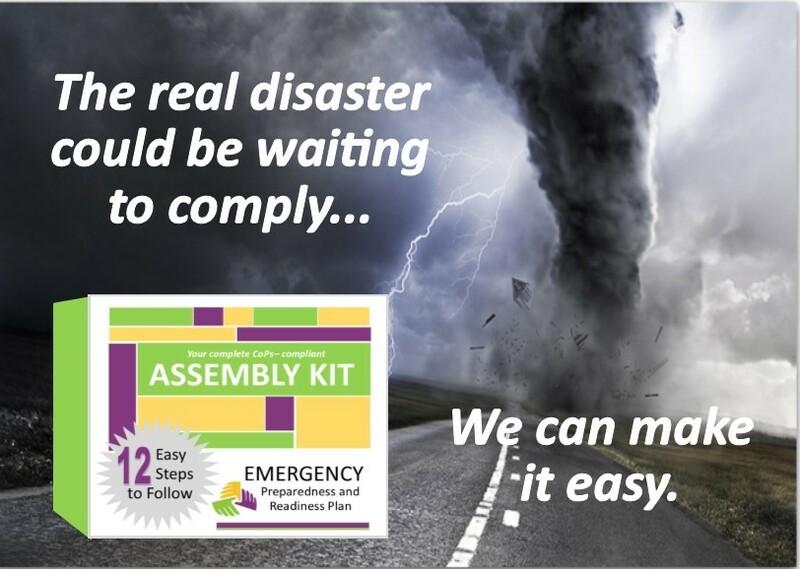 The Kit takes the cumbersome process of developing Emergency Preparedness policies and procedures and staging a community-wide disaster drill, and makes it simple to execute. 1. What format is the Kit presented in? The Kit comes to you in DIGITAL format so it is available immediately. You can get started on your Plan instantly! 2. What exactly comes in the Kit? — A VIDEO in which Home Health Solutions Owner J’non Griffin explains the Emergency Preparedness Program which new Conditions of Participation will require agencies to have in place by November of 2017. — A 12-STEP GUIDE which breaks down the cumbersome process of developing your agency’s program into 12 easy-to-follow steps. We explain each step and provide the materials you will need to implement it. One of the steps, for example, explains how to set up a community meeting with Coalition Members to plan your community drill. We include a copy of the invitation letter for you to send, a list of other facilities and/or community groups to send it to, and an agenda to follow at the meeting. — A SAMPLE PLAN to show you what your completed Plan should look like. — A section we call THE TOOL PACKET. It is filled with all the forms you’ll need to capture the information to fulfill the requirements of the CoPs for creating an Emergency Plan. There’s a sample Phone Tree and Crisis Communications Form for creating your agency’s Disaster Communications Plan, a sample Hazardous Risk Vulnerabilities Assessment, etc. This section includes more than 30 forms and tools. — An EP Survey Readiness Guide. We’ve used Interpretive Guidelines to create an at-a-glance look at exactly what Surveyors will be looking for when reviewing new agency Emergency Preparedness Plans. 3. Does the Kit explain how to stage a community-wide disaster drill? Yes. Our 12-Step Guide explains exactly how to go about planning this event, from who to invite to participate with you to a sample letter to send out to invite participants to a planning meeting. We include an agenda for that meeting and samples of items you will need to discuss and lists you will need to compile at the meeting. We can’t have the meeting or stage the actual drill for you, but we make it as easy as possible! 4. What about the Training and Testing portion of the Emergency Plan requirements? Our Tool Kit includes training materials on various natural or man-made disasters which you will be able to copy and provide to your patients and staff to fulfill CoPs disaster training requirements. Just be sure to document that you have provided these materials and when the training occurred. We also include some sample evaluation forms to use to review the communitywide drill afterward to help in conducting an annual evaluation of your Emergency Plan. 5. What is the “All Hazards” Risks and Vulnerabilities Assessment our agency is required to have, and is it included in the Kit? Our kit explains what this assessment is, and we provide a sample for you to follow. We also explain how to create your own Risk Assessment specific to your agency and community. 6. How long is the 12-Step Guide? How much reading will be required? We know you are busy so we have kept the entire Guide – all 12 steps and all the forms and tools included – right at 100 pages. The EP Survey Readiness Guide is a separate document, provided in spreadsheet format. 7. Our agency will need to have a written Policy outlining our Emergency Plan. Does the Kit address this need? Yes. A sample written Policy is included in the Kit. We recommend that you use it as the basis for your agency’s policy. It will meet federal requirements in its current form, and you can easily add any state-specific requirements to it. Some states, including Florida, will have a few extra Emergency Preparedness requirements that CMS does not require. Our 12-Step Guide directs you to work with your local Emergency Management Agency on the development of your plan, and your local office will be able to provide any local and/or state requirements which must be met in addition to what CMS requires. 8. How long will it take to get together our agency’s Emergency Program using this Kit? That depends on how many components of the program your agency already has in place and how quickly you are able to set up a meeting with your Coalition Partners and stage a community-wide disaster drill. In most cases, this project will take weeks of planning and collecting information, so we recommend that you get in started well in advance of the November deadline. 9. Our agency already has an Emergency Operations Plan in place, so we do not want to order the Kit. But we would like to know whether our existing plan meets new CoPs. We have the solution: the piece of our kit known as the EP Survey Readiness Guide may be purchased separately. Based on Interpretive Guidelines, this helpful guide is available in an easy-to-read, spreadsheet format and will review all aspects of the Emergency Program requirement along with bulleted points showing exactly what Surveyors will be looking for. Check our online store to order the Survey Readiness Guide. 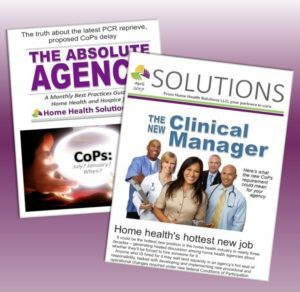 Remember, Home Health Solutions also provides customized education and training to home health agencies. Owner and President J’non Griffin will work with your agency to make certain you comply with the new Emergency Preparedness and Infection Control program requirements as well as any other aspects of the new CoPs.